The seven-seat Volkswagen Transporter T4, popularly known as a "Volkswagen Eurovan" in most parts of North America, is a German-made vehicle. The van was introduced and improved between 1990 and 2003 and one can find a used Volkswagen Eurovan in the market pretty easily. The van succeeded the Transporter T5. The Eurovan was the first in the production of Volkswagen's transporters to feature a front based water-cooled engine. As much as the predecessors are sometimes casually referred to as "Transporters" the Eurovan was the first to use the actual title "Transporter.” The T4 manufacturing ceased in 2003 after a run of almost fifteen years. It is the second only after the T1 for featuring such a production length in the market. 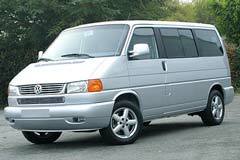 In 1996 the Eurovan was reshaped with a longer form to create room for a VR6-engine. Other vans produced between 1994 and 1999 can also have a long or short nose based on the model features at vehicle's base.